Finally these last couple of nights I managed to get some beading done! Yeeepeee! 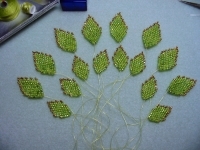 I hope these 16 leaves will be enough, if not, I'll have to make 4 more. I'm going to make the herringbone ropes first and attach them to see how everything looks. OOooh these beads look yummy enough to eat. Looking forward to seeing the finished result! So do I! ;-) That necklace has been sitting around way too long already! I think that it looks really good so far looking forward to seeing the turn out. I like your blog alot and enjoy reading about what is going on. Love you SMOOCHES. I'm so happy to see you here! Thanks! This last new sections to attach are driving me nuts, but hopefully I'll get them to work out soon.